A.M. Ran with a big group. We had Chad, Scott, Matt Poulsen, Dan, Brandon, and Brodie. First 10 miles easy pace up the Provo Canyon to the start of the 10 mile tempo in South Fork. Did that in 1:12:06. This was actually quite brisk, about 3 minutes faster than what I normally would do in this workout. But it is OK to push the first 10 a little bit outside of the very easy range as it helps dump glycogen to make the last 10 feel more like you are at the end of the marathon. I am estimating that in this workout if you count the fact that you are not tapered, this is like running the real marathon from 7 to 17 or maybe from 10 to 20, depending on how fast you run the first 10 and how drained you are at the end of the week. Regardless, it is a good marathon preparation workout - you avoid the real "zone", but you are close enough to it to prepare physiologically and psychologically without doing damage to the body. Brodie turned around early. Matt ran back at an easy pace. Brandon ran at about 6:00 pace. Dan ran with him for the first 6 miles. Chad tried 6:30 pace, but ran out of juice. I ran with Scott for the first 3.5, then eased off to what I could sustain. My time was 55:58, which is a record for this course by 12 seconds. In the middle I timed a mile in 5:18 on the Provo City Marathon course (1st mile), then another in 5:23 on the triangles right after Vivian Park. Once I eased off I was going around 5:40-5:45 pace. The 3 mile tempo course was 5:37, 5:44, 5:40 (17:01). My last mile, which is uphill, was 5:58. Scott got 54:28. Overall this was a good result, and I was happy that I was able to survive the aggressive pace in the first 3 miles, and survive afterwards. The pace actually did not feel too bad in principle, in some ways it felt like a jog, but my CO2 exhaust pipe was not ready for it. I think I should be able to hold that pace for the whole 10 in this workout if I get the CO2 exhaust pipe in shape. P.M. 0.5 with William, Joseph, and Jacob at Orem High including 100 meter time trial. William ran it in 27.6. I think he has 25 in him, but he still has not figured out the idea of sprinting. We need to do some practice. But even without it, I am not too unhappy with the result as William is still only 3 years and 10 months old. However, in order to win the Thanksgiving 400 he will need to improve his 100 to 25 by the time of the race. Day of rest. Went to church. It was a Fast Sunday. So Fast and Testimony meeting first. Then Sunday School - I went into the new member/investigator class. The lesson was on prophets. Then a lesson on missionary work in the Elder's Quorum from the First Presidency Message. A.M. Ran with the kids first. Benjamin did 7, Jenny and Julia 3, Joseph 2, Jacob 1. Then I ran another 3 miles with the weights and Julia and Joseph on bikes. Benjamin and I did a pickup for 500 meters in 1:39 to tune up for Benjamin's race tomorrow. A.M. Total of 12 miles. Did a workout. 12x400 down the Provo Canyon. It has been a while since I've done this workout. The precise reason is that it hurts so much that I always found an excuse to avoid it, and I had plenty. The main one is that by the time I am done running with the kids, I have neither miles nor time left for such workouts. Another one is that since I am a marathoner, I do not need to do such workouts. But I prayed recently for guidance, and felt that I should resume those miserable quarters. And not just 6 or 8, but full 12 with 200 recovery. I remembered today how much those hurt. Enough that I remembered the way they get a little kid to eat his food in Russia. A spoon for each family member. One for Mommy, one for Daddy, one for Grandma, one for Grandpa. Maybe one for a brother or a sister if the child is lucky to have one. Then you have to start all over again. I've fed our kids like that, and with the extended family involved I do not think I ever had to repeat the cycle. So I did each one of the first ten for somebody in my house, and I included Matthew who is not yet born. That made it easier. But still, you finish the first two, and you dread the thought of another one, not to even think about ten. You savor your 200 meter recovery jog, and then comes another one. I thought it would be good if I could average 72, but I was more fit for the pain than I expected. My slowest was the first - 70.2. Second slowest I was the fourth or the fifth I think - 70.0. I had a few under 69. The last one was the fastest - 67.1. Most of them fell around 69.4. Towards the end I figured out a form trick that gave me more stability on the right side, and I started to go sub-69 more consistently without more effort. Well, I did not really have more effort to give. That is the whole point of this workout. You make yourself hurt while trying to maintain the pace. You give yourself short breaks to reset the pile up of whatever it is that limits your speed just enough that you would not slug the next repetition. This forces the brain to find ways to run faster in a fatigued state. Since it cannot come through raw power, it comes through efficiency. You also develop higher pain tolerance. More specifically, you learn how to avoid panic at the signals of fatigue, which allows you to hold the fast pace a little longer. The kids ran on their own. Benjamin and Jenny did 3. Julia 2. Joseph and Jacob rested for the cross country meet in the event. P.M. Benjamin, Joseph, and Jacob ran in the cross country meet at the Kiwani's Park. The distance was 2 K. Benjamin won overall with 7:01 in spite of taking a detour that cost him who knows how much. The facts are that it took Benjamin 2:44 to reach a place where I was standing, while the second place was there in 2:54, which was prior to the wrong turn. At the next checkpoint it was 6:01/6:07. At the finish it was 7:01/7:11. So I am going to guess he lost at least 5 seconds, possibly more. In any case, 7:01 is still a good result running in front alone for most of the race. I did notice a problem we need to address. Benjamin's leg turnover is too sluggish - ground contact time looks excessive. He compensates with a huge stride, but I think it is out of balance. Well, the huge stride is great. What is out of balance is that he lingers too long on the ground. From the visuals, it makes it harder for him to maintain speed when he is tired. We will work on fixing that. Joseph had a great performance. His time was 8:45. Not only did he win Sub-Bantams (being only 7 he actually still has another year in Sub-Bantams), he beat the first Bantam boy, and what is impressive is that he had about a 2-3 second lead going into the last 100 meters, and he maintained it even though the older boy tried to kick. When you have a 2 year difference in age, the older boy almost always wins the kick. In fact, I believe this is the first time in our family history of running that with this age difference our younger boy did not lose the kick. Joseph improved his time from last year by 1:36. Our barely six year old Jacob had a great performance as well. He would have won the Sub-Bantams had it not been for his "bully" older brother. His time was 9:40, which is 41 seconds faster than what Joseph ran last year at the age of 6 years and 9 months. Jacob is only 6 years and 1 month old. Benjamin wore spikes, but the spikes we ordered for Joseph and Jacob had not yet arrived, so they wore Crocs. Joseph was OK, but Jacob lost his Croc with about 300 meters to go. He just kept on running. Later in the evening I ran 0.5 with William. A.M. Ran with the kids. Benjamin did 7, Jenny and Julia 3, Joseph 2, Jacob 1. I ended up with a total of 12, 2 with the weights. P.M. 5 total. 0.5 with William, 4.5 with Julia following me on a bike. A.M. Did another hard workout. 3x1 mile, exact repeat of last week. This one actually does not hurt as bad as 12x400 even though it covers the same distance. Slowing down to 74s from 69s makes a difference even if you have to run them back to back. But it still hurts, which is why I have been excusing myself from doing it for so long. I had an improvement compared to last week - 4:56.0 (vs 5:02.1), 4:57.5 (vs 5:04.8) and 4:55.7 (vs 5:01.2). So all under 5:00. Downhill, but still it was good to move the legs that fast. If we were to take the conversion factor of 11 seconds to Orem High track based on 4:52-5:03 results that Benjamin got in the time trials, this would translate into about 5:06 for the full mile and 5:04 for the 1600. Total of 13 miles. Kids ran on their own. Benjamin was in charge. He ran 7, Jenny 3, Julia and Joseph 2, Jacob 1. P.M. Total of 5. 0.5 with William, 4.5 by myself. A.M. Ran with the little kids, then with Benjamin and Ariel. Benjamin did 7, Jenny and Julia 3, Joseph 2, Jacob 1. Benjamin, Ariel, and I did 5x100 pickups at 4:48 pace down the canyon. The purpose was to teach Benjamin faster leg turnover. P.M. Jenny took William for 0.5 miles. A.M. Ran with Chad. Total of 15.5. Chad did 20.5, having run 5 miles before we started together. Given the upcoming Top Of Utah Marathon I did an medium long run with a short fast tempo run instead of the full 20 with the last 10 fast. Chad joined me. To spice things up he started 1:00 ahead of me in our standard 3 mile tempo run from Nunns Park to the mouth of the Provo Canyon. This is the third time we've done it like this. The first two times Chad ended up finishing ahead. Today was finally my day. It did help some that Chad was worn out some from the 5 miles earlier and did not have Benjamin to stir him up. Originally we were planning on having Benjamin around, but he had some signs of a sore throat and we decided to have him run less and slower - 4 easy miles with his siblings instead of his usual 7 with me. I ran 15:32 with the splits of 79 - 76 - 78 - 76 (5:09) - 76 - 78 - 78 - 80 (5:12) - 80 - 79 - 78 - 74 (5:11). I passed Chad almost exactly at 2.5 mark He finished in 16:51 in spite of the fatigue and opening with a 74 quarter, which is still a decent time for him. This is my fastest time this year, 1 second faster than the fastest time last year, and only 17 seconds slower than my best time ever. I experienced an interesting feeling in the tempo. I was breathing very hard the entire time, but I could manage it. Earlier when I was running in the 15:50 range when that feeling came I just slowed down because I could not handle it. Last year I ran 15:33 in this workout, and then 2:34:15 in TOU. 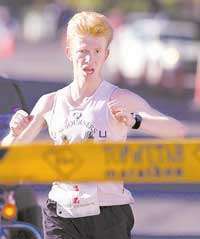 I felt that TOU was an off-race that was salvaged by having somebody to run with (James Moore) for 24 miles. We will see what happens this year. I hit pretty much the exact same time as last year in this workout. I suppose if the conditions are good and I feel good, we will find out exactly how much off I was last year, or maybe if it was just a perception. I wrote 2:29:59 on my entry form for the predicted time. I've run the race 13 times and I do not think I ever quite delivered what I hoped for on the form. Maybe this year I will. We had a Stake Conference today instead of regular church meetings. This was actually more of an area conference - it was broadcast from the Marriott Center to local stake centers. We heard talks on a variety of subjects. Elder Oaks spoke at the end. A.M. Ran with the kids. Total of 10 miles. Jenny and Julia did 3, Joseph 2, Jacob 1. Felt good, no fatigue from the marathon in any way that I could feel, but probably some in subtle ways. Taking it cautiously, so ran only 10 miles. Did a pickup for 0.5 in 2:40 down the canyon. A.M. 12.7 miles total.Jenny, Julia, and Joseph did 1. Benjamin did 3. Cross-country race in the evening. I ran into Cliff Reed, a 56-year-old runner with a 3:07 life time marathon PR, and most recent best 3:42. We ran together, and I talked him into doing a 3 mile tempo run on my standard course - Nunn's Park to the mouth of the canyon. He was planning Yasso 800s the next day. I told him most likely he did not need to do that, but as a cut off to see if there was any chance that he did (he is 56 years old after all), I set a target time of 23:00 for the 3 mile tempo assuming his goal in the marathon was 3:35 in St. George. He smashed it while remaining conversational in the first 2 miles. The splits were 7:11 - 7:11 - 6:51 with 21:13 total time. I told him he had enough speed to run his life time best, but he needed more marathon-specific endurance, which comes mostly from mileage. P.M. Cross-country race at Kiwani's park. We had all the kids except Stephen participate as it was only 1 K.
Benjamin won overall with 3:07 with a 19 second margin over second place. He looked great. His stride had some turnover today, not just the stride length and he looked like a professional runner - very smooth and gracious. That's the best I've seen him look ever. Jenny made her come back to racing with the third place in the Midget girls division and the time of 4:05. The winning time was 3:34 - Madison Malmgren. Based on 800 meter PR (3:08) relative to Benjamin (2:23) we should have seen exactly the time she ran. Joseph won the Sub-Bantam's with 4:28. However, something was wrong with him. He ran faster in the 2 K. I was expecting to see at least 4:10, and possibly under 4:00 based on intuition. Mathematically, prorating off Benjamin and 800 meter track PR (3:07), he should have run 4:04. His time in the 3 K was also rather slow relative to his 2 K, but at least it was decent and you could write it off as struggles from the lack of experience racing 3 K. But he does know how to race for distances 1 mile and shorter - we do time trials frequently, and he successfully raced in the 2 K. I am suspecting something is wrong with his spikes. His best race so far was in Crocs, which I find rather odd - I thought spike would win hands down over Crocs on cross-country. But I suppose little kids have a hard time using the spikes. Benjamin ran great in spikes, though. Julia won the Bantam girls with 4:29 finishing right behind Joseph. I was expecting her to win, and I was expecting around this time intuitively more or less. Prorating off Benjamin and 800 track PR (3:16) she should have run 4:16, but I was not expecting that because she does not know how to run fast in a race and she has a wide fluctuation in performance from day to day. However, this win should give her a nice confidence booster. Jacob struggled more than anybody today. His time was 5:07 and his form did not look good - he looked like he was limping. His time should have been at least 4:40 based on the 2 K. Pro-rated off 800 m track PR (3:25) and Benjamin's performance, we get 4:28, but again 4:40 would have been more reasonable as he still does not quite know how to race - he just barely turned 6. But not 5:07. I am suspecting very strongly the problem is in the spikes. This still gave him 4th place in Sub-bantams which is 8 years and younger. Even though Benjamin's performance was very good, William impressed me the most of everybody. He asked if he could run the race the day before. I was hesitant - he would have had to run around the field unsupervised. He is at the age where he might decide to just wonder off the course, and then good luck finding him. But I prayed and I felt that we should let him run and he would be fine. So we signed him up. He hesitated at the start not quite knowing what to do. Then he started running only to fall down 50 meters into the race. He lay on the grass for 5 seconds or so, then got up without expressing any negative emotions, which was quite remarkable for a child 3 years and 10 months old, and resumed running. He actually ended up beating a 6 year old girl, and finished with the time of 6:28, which is 10:24 per mile pace. That is actually what I was expecting under the assumption that he would run all the way without stopping or getting lost, which was a very optimistic assumption. But he did it! A.M. Total of 12. Ran with the kids. Benjamin did 7, Jenny and Julia 3, Joseph 2, Jacob 1. A.M. Total of 12. Ran with the kids. A passerby asked me if I was the dad or the kid. Benjamin did 7, Jenny 3, Julia and Joseph 2, Jacob 1. A.M. 12 total. Ran with the kids. Benjamin did 7, Jenny and Julia 3, Joseph 2, and Jacob 1. I was not planning on doing anything fast, but my legs were itching to go a little fast, and I had 7.4 miles left when I started the run with Benjamin, and I did not want run the extra 0.4 after I was done with him. So a natural solution was to run a short tempo starting about a mile before the turnaround, go a little further, then turn around and catch up. So I ran 1.25 up and 0.75 down. Benjamin ran the last 500 meters with me after I had caught up - I wanted to stop at some even number and I was already past 1.5 mark when I caught him. So I had these splits: uphill 88, 85, 87, 88 (5:48), 88, then turned around and went downhill - 82, 79, 76 (5:25, 11:13 for 2 miles). During the easy part of the run we had a physics lesson and talked about various forms of energy. If only our collision with the ground when running was perfectly elastic we could run forever with a very minimal effort and very little risk of injury. Instead our bones, muscles, and joints absorb the energy of the impact which could have been converted back into the energy of the movement. So a good portion of our hard work goes into pounding our body instead of moving forward. The harder you run, the greater fraction of the energy you lose. Reminds me of taxes. P.M. William did 2x400 on the track by himself. I was originally going to run with him, but he insisted on doing it by himself. So he did the first one in 2:18, and the second in 2:34. Jacob did 1:39. Joseph did 1:27. A.M. Ran with Chad, Rachael (RAD), and George. Total of 20 miles. Rachael did the first 8 with us, then ran back. George stayed with us for the first 9, then fell back and ran slower. Our first half was 1:20:23, a bit slower than 8:00 average, which is actually not too slow for the uphill. On the way back we ran faster. I figured a good target would be to start around 7:00 pace, and gradually increase it. So we gradually worked up to 6:40 pace, coasted there, then we did 6:06, 6:16, 6:10 for the 3 mile tempo. Chad survived another mile and a half or so at 6:20 pace, and then struggled on the hills slowing down to 7:00. Our total time was 2:25:28 with the last 10 in 1:05:05. Day of rest. No regular church today again, we had the Brigham City Temple dedication broadcast. Then I took the little kids to the Provo Temple grounds later in the evening so they could have some temple experience as well. A.M. Total of 12. Benjamin did 7, Jenny and Julia 3, Joseph 2, Jacob 1. I did a pickup for 0.5 in 2:34. A.M. Kids did not run in anticipation of the cross-country race tonight except Benjamin who ran 3 miles. I did a 6 mile tempo run out and back on my usual Provo Canyon course. I felt like I usually do in such workouts, but I think finally have found the right words to describe it. I felt like a captive bird that has never been free but yet somehow knows freedom and yearns for it. More than that. It is more than just I wish I could be free. The bird knows that it does belong in that cage. I would compare it to a feeling I had while living in the Soviet Union. I had never been free, but somehow I knew the leash was too short and I should not have been on it. Most of my friends did not seem to be aware of the leash, and if they were they did not seem to mind. At least perhaps they thought that it was not practical to think about breaking away from the leash because it was next to impossible. Now it seems I am going through this theme again trying to break away or break through what is impossible to break through - defective vertebrae. With every step it screams at me. No, there is no physical pain. But it is like a broken musical instrument. If I could just believe this instrument is not a musical instrument and was never supposed to be one I would treat it like the noise of a car engine - it is OK that it is not musical because it was never supposed to be. But something deep inside is telling me I am not dealing with some odd noisy mechanism, but a musical instrument of fine work that is out of tune due to a relatively small but difficult to fix problem. So I spent 34 minutes 29.4 seconds fighting the trap today. Better said, shaking my fist at it and keeping the body and the spirit from giving up the fight. Mile splits: first three uphill 5:49, 5:58, 6:09 (17:55), then turnaround and then downhill 5:37, 5:34, 5:23 (16:34). P.M. Cross-country race for kids at Kiwani's park. The distance was 4 K. Benjamin won in 14:54 with his patented long kick. The race turned tactical. Benjamin was running with Casey Clinger, Grant Gardner, and another kid, I think his name was Madison, at a pedestrian pace for the first 1.5 miles which they covered in around 9:22. Then Benjamin and Casey turned up the heat, which dropped Madison. With more heat Grant dropped back. And once Benjamin turned it on he was left alone and ended up beating Casey by 5 seconds. After the 6:15 pedestrian jog for the first 1.5 his last mile was 5:32. Joseph ran a solid race winning the Sub-Bantams in 19:01. Jacob was second in the Sub-Bantams with 20:35. Both of them did better than in the last two races. We took the spikes off Joseph's shoes, and Jacob ran in Crocs. For Jacob I think it was a very solid time. This is 8:17 per mile average on grass with hills over the longest distance he's ever run, and he just recently turned 6. Jenny struggled today and finished 4th in the Midget girls with 21:08. Julia also struggled with 21:44, but other Bantam girls struggled more so she ended up winning her division. I ran 0.5 with William later in the evening. A.M. Total of 12. Ran with the kids. Benjamin did 7, Jenny, Joseph and Julia 2, Jacob 1. A.M. Benjamin and Julia were at gradma's house and ran 7 and 3 miles respectively. I ran 3 with Jenny, 2 of which were with Joseph, and 1 with Jacob. Then I ran 9 more - total of 12. About 3.3 miles into it I saw a guy in military uniform, and I knew that ROTC was doing a 2 mile time trial. I did not know how far the cadets were. All of a sudden I had a compelling thought that I should run faster, so I sped up to sub-6:00 pace. I did a mile in 5:56 and was past my turnaround and still had not met anybody. I jogged a bit further, and then saw the cadets. I paced the first one for the last 1.5 miles. His name was Tyler. He told me his goal was under 13:00, but he was able to run much better - 11:38. A.M. 20 miles total. 8 mile warm-up, then did 3x2 with 1 mile recovery jog down the Provo Canyon. The first one was from Vivian Park to the waterfall. This was was the hardest because the first half of it is flat and it is at 5200 feet. The split was 10:41 or close - the marker was actually missing, but I saw the split with 300 to go and am estimating. Then I jogged a mile backwards and ran from the middle of the woods to a little bit past Nunn's park in 10:33.3. The last one was from the waterfall to a little bit past the tunnel, and it was the fastest because I increased the effort knowing there was nothing left except the jog back home. I was also being spurred by the runners in some race (5 K I assume) that provided a constant stream of nice easy to reach goals. The time was 10:31.7. It was the hardest interval, though, not just because it was the last and the fastest, but also because it started getting warmer. Day of rest. Went to church as usual. We had a missionary farewell. One of the speakers gave a very memorable talk on obedience that involved a colored up version of the interactions between Nephi, Laman and Lemuel. It was completely based on scripture aside from the dialogues that may or may not have happened, but somebody who had not read the account in its entirety or has been spacing out as he read it might have wondered - where are you getting this from? As I get older, I appreciate more and more the value of that story. It was the discussion of Laman and Lemuel that helped Benjamin break 6:00 mile for the first time and never look back. He was a different person after that. I've used that story many times on many occasions in our home when a kid lacked the motivation to do something that I knew was good for him and murmured. That does wonders. They know the story very well, and none of them want to be like Laman and Lemuel.